For servers without CD drive or remote KVM you might want to use an USB Flash Drive to install ESXi to the hardware. 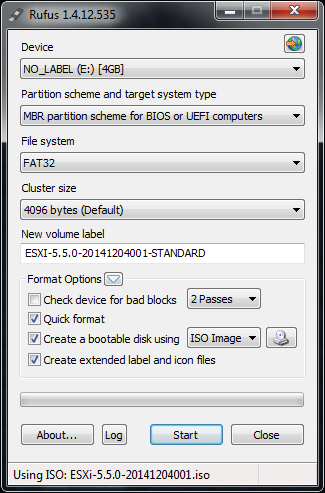 This post explains how to create a bootable ESXi Installer USB Flash Drive in less than 2 minutes. The Flash Drive will work totally identical to an Installable CD. 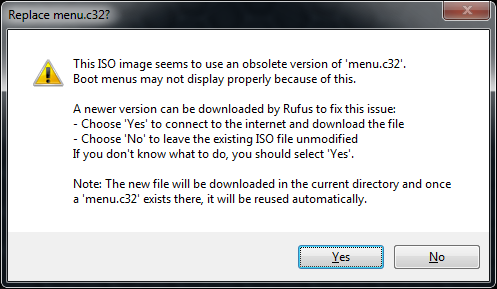 Select Yes when it asks to replace menu.c32. Rufus will now create your bootable ESXi Installer USB Flash Drive. This will take about one minute. 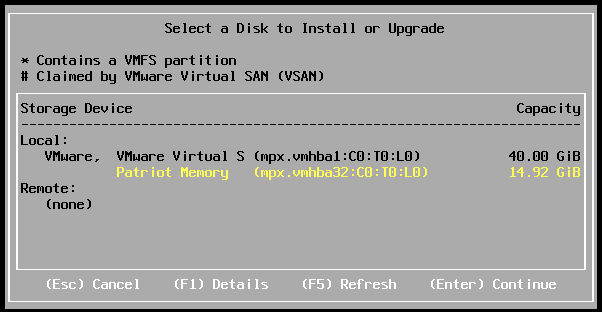 When you boot a server with this USB Flash Drive the ESXi Installer will copy the whole installer to the memory which means that you can install ESXi to the device where you are installing from. Just select it during the installation. This also works for diskless ESXi hosts where you want to install ESXi to an SD Card. ESXi 5.x Installation on Intel NUC fails with "No Network Adapters"
Many thanks for you for help! Can someone help me figure out why the USB install on my NUC 5i5RYK doesnt see my Transcend 128 GB SSD M.2 drive as an option? The only option available is to install back on the USB. Thanks for this guide, I asked how to do this on another thread and my answer was right here! I'm using this for 1st Intel NUC that arrives tomorrow. . So, first NUC, first time using ESXI. It is going to be an adventure! hero status! thnx for making this! Wonderful! This worked great. Thank you!! Thanks great article and works fine. Exelent and simple guide! Worked OK! I created the USB boot drive with the procedure but didn't work ... in boot sequence appear Unknown Device. What could be the problema? Everything is rigth .... all worked properly!!! I bought a CD reader, but with this guide, the NUC is completely intall in a while. Thanks for your software support. I did successfully bootable. Thanks so much. This worked like a charm! Thanks for posting! Thanks!! Using unetibootin wont make your USB drive bootable. I tried with the latest version of rofos and it didn't work. downloaded 1.3... and was able to create bootable USB. Just FYI if any will have the same issue. There is a software called Universal USB Installer by this software you can easily create your USB bootable on Linux. For that, you have to download the software on your system. Before that, you make sure that you have installed the Linux on your computer.